It will make an appearance at the 2019 North American International Auto Show. 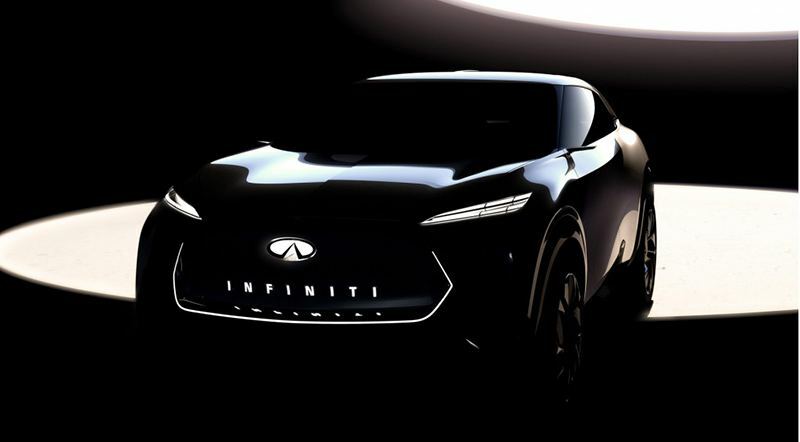 The Japanese luxury auto-making company Infiniti recently released a teaser image of a concept preliminary showing an electric crossover SUV. The Infiniti electric SUV concept is scheduled to make an appearance at the 2019 North American International Auto Show in Detroit next month. The concept will kick off Infiniti’s 30th-year celebrations. The marque was unveiled in 1989 in the same show. The Infiniti electric SUV concept car has clean-cut bodywork contours and a muscular look in line with Infiniti’s new designs philosophy. Revealed at the 2018 Pebble Beach Concours d’Elegance in the form of the Prototype 10 Concept, the entire series of electrified cars by Infiniti will share the same design language as well as an electrified, highly modular platform. However, this concept will be the first car equipped with this platform, showing off the platform’s parallel hybrid and pure electric powertrains. This will allow electric vehicles with this platform to supply 400 horsepower and 482 km of range. The electrified platform will also come with a number of hybrid powertrains named e-Power. Electric cars with e-Power will charge their batteries will use energy regeneration techniques where the combustion engine will act as a generator. So far, this is the only information available on the Infinity Concept crossover SUV. You will have to wait until the 2019 North American International Auto Show starting on January 14th, 2019, to find out more.